Andy Hampsten rode into cycling legend almost 26 years ago, when a blizzard engulfed the Passo Gavia, and the Giro directors refused to cancel the stage. It was epic stuff for fans, but a living hell for the riders. PEZ-fan Richard Clayton re-created the play-by-play with the help of Davis Phinney & Ron Keifel. This story was recreated by PEZ-Fan Richard Clayton, with the help of Davis Phinney & Ron Keifel. Redlands California in 1988. 87 degrees. The local news paper shows Andy Hampsten has the lead in the Giro and I thought: Cool!! I had no idea what had happened. For 25 years I have learned as much as possible about that day. -- Welcome to stage 14 from Chiesa in Valmaleneco to Bormio. It is raining in Northern Italy. Raining hard! And it's cold! Weather reports from the course - especially the Gavia pass are sketchy and race organizers are not sharing info if in fact they have any. Mike Neel and Jim Ochowitz have made a call to a restaurant at the top of the Gavia and the report is snow. According to Ochowitz the 7-Eleven Hoonved team support are in local ski shops buying cold weather ski gear for the team in case the weather is as bad as it's suggested to be. We asked Davis Phinney the mood of the team. His reply: “There is a lot of trepidation about this stage both because of the climb and the weather.” Trust me, that word rings ominous right now looking at this weather and knowing what's ahead. There are a lot of distant stares from the riders. Andy rounds a turn somewhere below the summit. Italy's Franco Chioccioli (Del Tongo) is still leading the race at 64 hours, 31 minutes, 45 seconds and wears the leader's pink jersey. In 2nd and 3rd are Urs Zimmerman (Carrera) at 33 seconds and Roberto Visentini (Carrera) at 55 seconds. This is the second time since winning the '86 Giro that Visentini has been in a fight for team leadership with a non-Italian teammate. Last years Giro between Irishman Stephen Roche and Visentini was a full on war. Visentini is finding himself in familiar territory. In 4th is Flavio Guipponi (Del Tongo) at 1:10. American Andy Hampsten is in 5th at 1:18 and is wearing the blue combined points jersey. When we asked him about having the jersey he said: “I'm glad right now to have any jersey because they're wool and warm.” Finishing the top ten is Jean-Francois Bernard (Toshiba-Look) at 1:26, Erik Breukink (Panasonic- Isostar) at 1:45, Beat Breu (Panasonic) at 2:48, Marco Giovanetti (Del Tongo) at 3:07, and former World Champion and Giro Champion in '79 and '83 Giussepe Saronni (Del Tongo) at 3:25. Second place in last year's Tour Pedro Delgado (Reynolds) is in 14th place at 4:43. To add insult to injury the stage today starts down hill into bucket loads of cold rain. Davis Phinney talked about Andy and about the team's preparations. “Andy is riding well and this is an important day. The team is strong and we're ready to defend his position. We purposely train in Colorado in poor weather and we pride ourselves on being tough.” “Andy is from North Dakota and has developed a toughness for foul weather. He is well prepared and will be the 'Hard Man' of the day.” Davis also let us know that team support is ready with extra cold weather gear and hot drinks for the descent into Bormio. The rumors of snow are starting to grow and the race starts in gray gloomy conditions. Television images now confirm snow on both climbs and it is near white out conditions on Gavia. The pace looks more like an effort to stay warm than any plausible race strategy. Some riders are starting to suggest that if the snow is bad enough they will stop and protest. The Pass Gavia has become as iconic to thew Giro as Alpe d'Huez to le Tour. The Gavia has not been a part of the Giro since 1960 when Luxembourg's Charlie Gaul won the stage ahead of eventual winner Jacque Anquetil and second place Gastone Nencini. All three Tour de France and Giro winners. The Giro has taken on a one dimensional tone over the years with strong Italian personalities shaping the race for Italian interests and Italian teams and is making a push to be more on par with the Tour de France. According to Hampsten: “The 7-Eleven sponsors know this is primarily an Italian event so a win would be important.” “Hoonved on the other hand has twenty years of sponsorship and they fully understand the magnitude of the Giro d'Italia in both European and International sports.” The stage today could explode the Giro internationally. 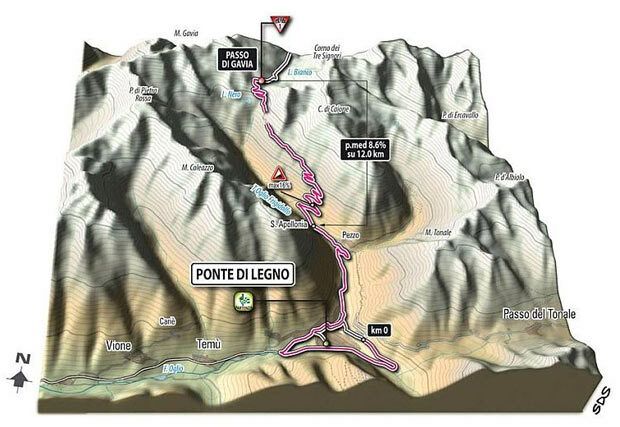 The difficult Gavia and Slelvio stages have been included in the Giro this year due to slumping tv and advertising interests. There is very little chance the race organizers will cancel this stage regardless of how bad the snow is. 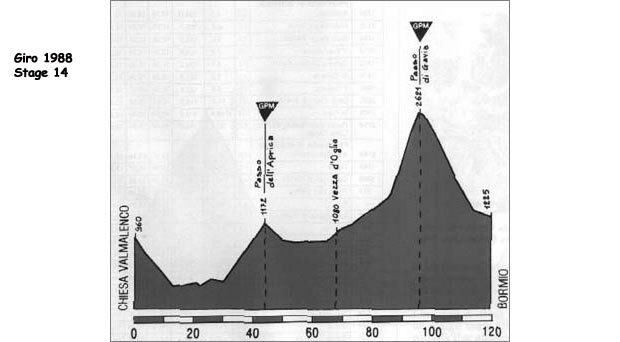 The climb is starting up the Aprica at 12 km and 2000 feet at 6.4% followed by a 1500 foot descent. The snow just started and we are only 200 meters above sea level. Passo di Gavia is 16.7 km with an average 7.9% grade and a maximum 16% grade. Gavia summits at 2618 meters. That's 8589 feet. During the first weeks of the race the 1966 winner of the Giro Gianni Motta has become a friend and ally of 7-Eleven he told Andy he can win the race and that Gavia is where he can take the maglia rosa. We asked Andy about the conversation and he kinda chuckled saying: “I told Gianni thanks for the compliment but he let me know the Italian teams were not prepared for how hard the climb would be.” Gianni raced against some of the greatest in cycling history including Jacques Anquetil, Felice Gimondi and Eddy Merckx. It is very cool that an Italian winner of this race has been so supportive of this team. Andy and all of the guys on 7-Eleven have said the same. Since 1985 7-Eleven has impressed the Italian tifosi and Europeans with their ability to not just compete but win. Both Ron Kiefel and Andy won Giro stages in '85 with the encouragement of Greg Lemond and Andy has won the Tour of Switzerland twice. This is a complete team today. Mike Neel shared how the team prepares for cold and wet: “Lanolin all over, not just legs. Some riders have added Cramers for heat. Each rider has their own preference for how hot they like it!” He also said in addition to winter ski gear and Oakleys they had neoprene gloves which Andy now has. The weather is deteriorating . Not that it hasn't been really bad, but fog is setting in and the snow is wet and sloppy. The roads are ride-able but we're still at lower altitudes. The cold weather gear most of the riders have is soaked and has to weigh at least 10 kilos. Any riders serious about racing over the Gavia will have to shed most of their cold weather gear on the final climb. Going up will be do-able, but going down will be beyond bad. Before today's start, technical race director and former Giro winner Francesco Moser urged race director Vincenzo Torriani to cancel the stage. Torriani told him: “The show should go on and the riders should suffer through.” In the past when Moser was racing he would have used his influence to prevent hard climbing stages. With Moser retired the organizers have made the race more difficult and dramatic and Hampsten has been given a race that suits his climbing strength. Franco Chiccioli in the abyss. 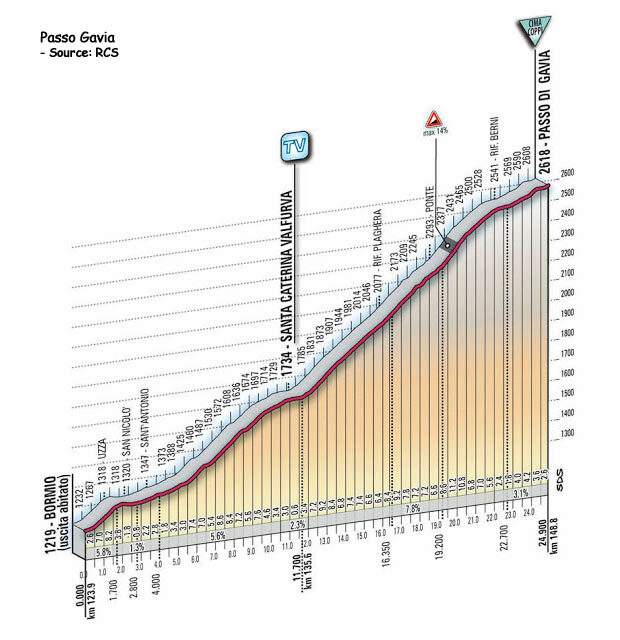 The race has summit-ed the Aprica and we are still at groupetto pace with riders shivering in misery. The Italians are asking Andy to ride “Piano, Piano!” That's not going to happen. Over the top and on the descent it looks like the Del Tongo team is starting to set the pace for Chioccioli. The organization at the front is very loose and most riders still appear to be in survival mode. Hampsten and 7-Eleven are literally in the middle of negotiations with the entire peleton to race the final climb. Some riders are threatening to stop before the climb all together and others just don't want to race in such miserable conditions. Everyone knows that Andy is riding well and needs tough climbing to gain time. Jean Francoise Bernard said: “Andy is the strongest in the race so far and this stage and the Stelvio stage have been targeted by all the favorites as critical.” Andy is keeping everyone on their bikes so far and should be recognized for his negotiating skills. This is real corporate boardroom kinda stuff. All at 25 mph on a bike in the snow. Johan Van Der Velde who is in the purple points leader jersey jumped away toward the climb. Van Der Velde has won the Giro points jersey twice and he won the white jersey in the 1980 Tour de France. He is down to short sleeves, team shorts, shoe covers and no gloves. An earlier break with stage 3 winner Swiss Stephan Joho (Ariostea) and Italian Roberto Pagnin (Gewiss-Bianchi) is up the road but neither is a threat and honestly they may just be trying to stay warm. 7-Eleven continue bringing up hot tea keeping Andy ready for what lies up the road and the lead group is starting to shed cold weather gear for the climb. Passing the town of Pointe di Legno and crossing the wooden bridge signals the start of the Gavia. Every rumor of snow at the top of Gavia has been completely confirmed. There are riders still debating a strike and someone just yelled: “Hey Andy. You're not going to attack are you?” A cold determined stare seems to be the only answer. Del Tongo is setting tempo on the climb and the field is slowly stretching out. Van Der Velde is off the front with what is now a nice lead. If he is first over the top he will win today's stage. The road will climb another 4 km from here then it pitch up to 16% and turn to dirt. Everyone knows Andy will attack soon and after winning the Selvino stage two days ago he has proven he has the strength to separate himself off the front. 7-Eleven has done a great job delivering Hampsten on the Gavia and he is in attack mode. Everyone's face shows a determined resignation to the suffering that has already started. The first hairpin reveals a 16% grade sign and as expected Andy attacks in his 39x25. The front of the race is starting to stretch. The final selection has started with Hampsten, Chioccioli, Urs Zimmerman, Eric Breukink, Bernard and Delgado. Chioccioli is on Andy's wheel and his face has gone slack. He has an uncanny lean gaunt resemblance to the great Campionissimo Fausto Coppi and has been given the nickname Coppino. He won the white jersey in the '83 Giro and is a real contender with Del Tongo. If he gets full support today he could secure his leader's jersey. The weather report from race radios at the top is not good but the roads are clear enough to pass. The lead riders begin slogging through the thin layer of mud and snow and are following in the tire tracks of cars to find the best path. The grupetto or “laughing group” has formed at the back, however no one is laughing. Hampsten sets the pace while Chioccioli and Breukink fasten their seatbelts. The race is now down to its essentials between Chioccioli, Hampsten, Breukink Zimmerman and Bernard. Delgado is putting himself in a position to be a contender for the stage and Van Der Velde remains up the road in a very heroic determined effort. The gap on Breukink is opening as Hampsten applies steady pressure. Chioccioli and Zimmerman start to suffer and Zimmerman is sliding back. From the look on Chioccioli's face it won't be long before he's dropped too. Andy is off the front and the race like the weather has disintegrated behind him. Breukink looks the strongest of the chasers and has bridged to the front of the chase which is still losing time on Hampsten. Delgado is visibly suffering as is Chioccioli. The sleet has turned to snow and a white layer is forming on both the road and the riders. The snow is coming down in big Christmas like snowy clumps. The descent will be into a “howling” headwind and will be nasty There will a flat section at the top of the climb, 3 km of paved road then single lane dirt with steep sketchy twisty cold wet downhill. The real threat is hypothermia for all the riders. Hampsten has dropped everyone and is alone. There is snow in his hair and he looks to be barely staying warm. Yoho and Pangin are coming into view and Andy is tracking down Van Der Velde for the stage win. Van Der Velde in his short sleeves looks completely out of place in this weather. Van Der Velde is out of the saddle and has amazingly stayed ahead of Hampsten. This is the ride of the day so far and what is even more amazing and scary is that he is about to start this descent in short sleeves. Race radios just reported race officials cars blocked in with all the snow and chaos nearing the top. Behind are all the team cars. This is starting to get crazy and the riders will have to navigate through the snow and all of the race caravan. The temperature at the top is -4 C (25 F). Van Der Velde has stopped at his team car and is being handed a plastic rain jacket and a cotton race cap. He is literally freaking out and yelling in disbelief. Hampsten is coming up through the cars and will be at the top soon. 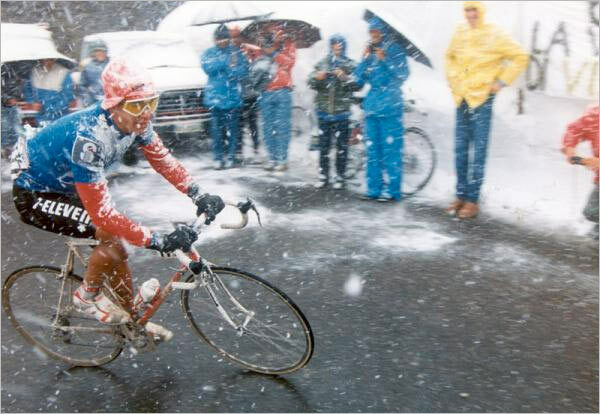 At 2 km Hampsten has takes his cold weather gear from Ochowitz who has been at the summit for a while. With the exception of 7-Eleven none of the teams seem prepared for what is happening. 7-Eleven have cold weather bags and hot drinks for their team and it is proving wise. Hampsten takes his gear and immediately starts to struggle. He just brushed a big clump of snow out of his hair and is slowing and zig zagging in an agonizing attempt to put on his rain jacket. He's all over the place. At this point he should just stop put a foot down then start again. Literally the weather is affecting not just physical strength but mental reasoning. In any other conditions this would seem comical. Breukink who has separated himself from the chase group is coming up behind Hampsten who is still struggling with his gear. He has made up 43 seconds and will lead Hampsten over the top as they start the 15 km descent into Bormio. Van Der Velde is starting down the Gavia but the look of terror on his face is palpable. Amazing... He has turned around and is riding back to the top! 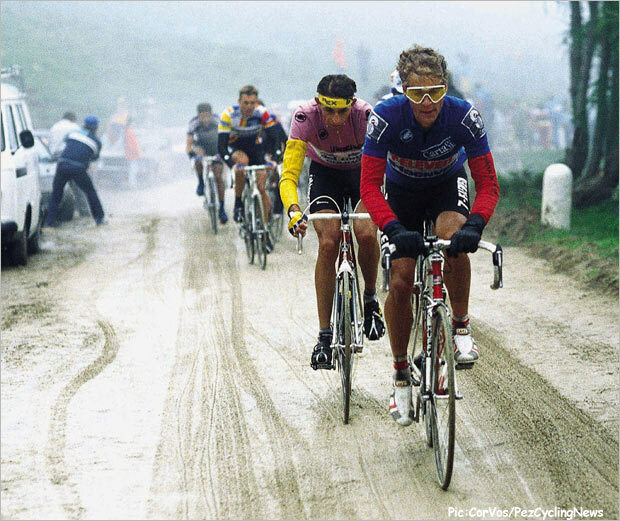 Breukink and Hampsten pass him on their way down and he's in complete despair. He looks to be riding back to his team car. The stage is now between Andy Hampsten and Eric Breukink, who has slowed and Andy comes past in what appears an attempt more to keep his legs spinning rather than take the lead. Behind the carnage has started. Riders approaching the summit face sheer terror at the thought of descending 25 km into what has now turned to into a full blizzard. Riders are making their way through the maze of cars, team support and fans. Most are literally unable to function and are stopping for any help with jackets and any warm gear that is available. Riders are off their bikes. It's not just desperation, it's primordial. Grown men who can't speak are desperately looking for any help available. Some are getting in cars with spectators with hot drinks and warm back seats. There are no lead cars and there is no group any more. Some riders are stoically putting on plastic rain jackets, climbing back on their bikes and riding into misery and what will surely become cycling immortality. Chioccioli is several minutes back and has found a very unprepared Del Tongo team car at the top. He will have to descend in long sleeves and a head band. Panasonic is in the same predicament and Breukink is sent down the Gavia with no jacket or hat. Jean-Francois Bernard is getting warm gear, Oakleys and support at his team car and Delgado is stopping for gear too. The impetus to race has been replaced by the need to survive. Chioccioli is visibly suffering and will lose a lot of time if he cannot physically survive this. 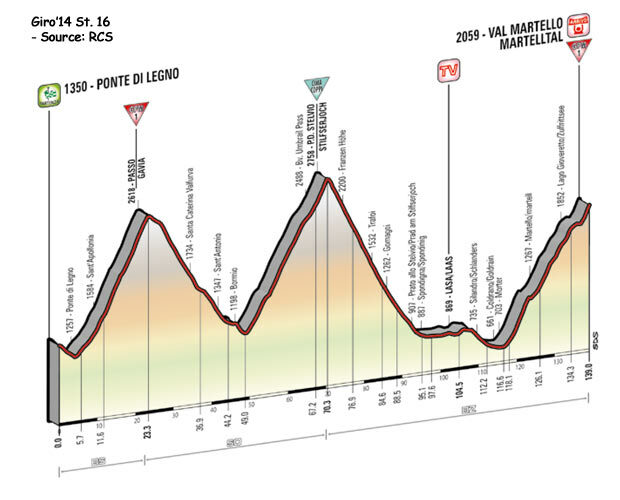 So far we have Breukink and Hampsten together on the descent followed individually by Chioccioli, Roberto Tomasini (Fanini-Seven Up), Flavio Guipponi, Marco Giovannetti, Urs Zimmerman, Peter Winnen (Panasonic), Sergio Finazzi and Pedro Delgado. More of the 7-Eleven team are reaching the team cars and are getting their gear. There is such a stark difference in the support and gear being given by other teams. Some teams have a few extra jerseys or gloves and some riders are still in short sleeves. Ron Kiefel is taking several minutes to get his jacket on and take some hot drinks. Other riders seem on the verge of collapse and can barely speak. Del Tongo are very unprepared are disintegrating as a team. It looks like Hampsten and 7-Eleven are going to out smart and out tough the Italian team. Breukink is in arm warmers and shoe covers on the descent and he is suffering but staying near Andy. The two just passed a Carrera mechanic walking down the middle of the road with a pair of race wheels. He must have thought the race was canceled. The look of disbelief on his face is understandable since there are no lead cars or motorcycle. 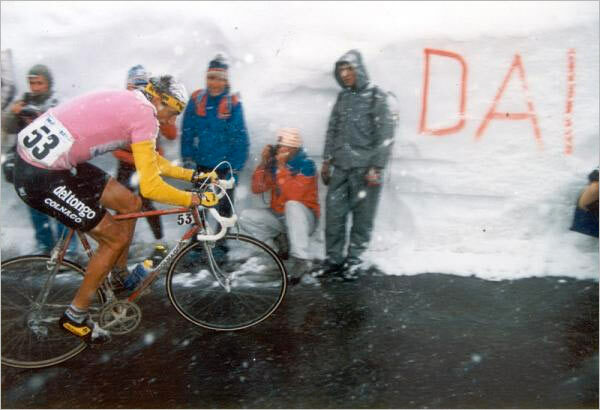 Hampsten and Breukink are leading the Giro in a blizzard with no one around them. Snow and ice are building on them and Andy's gears have frozen in the 53x14. Both are braking and pedaling at the same time and shaking uncontrollably. Visibility is 20 to 30 yards on this narrow twisty road. Both are making their own way down and seem to be lost in suffering. Hampsten just looked at his legs. They are bright red and his shins have ice on them. I don't think he will look again. 3 km before Santa Catarina and the snow turns to sleet. It does not feel warmer. Breukink is close behind on these turns but is continuing to take it slow. At the village Santa Catarina the final 13 km of road is paved two lanes at 8% grade. The strait downhill may change things. Both riders still look dazed and there is no way to imagine their thoughts. Both riders have continued pedalling which has kept their legs from seizing. Breukink is coming up behind Hampsten at 8 km and passes Hampsten. Hampsten still in his rain jacket is slower on the strait sections. I don't think he's going to take his jacket off. Breukink looks good now although he must be suffering desperately. His team car has come from behind and team manager Peter Post is yelling and cussing to urge him on. Hampsten tried to jump on his wheel as he passed but could not hold. Mike Neel in the 7-Eleven car is now behind Hampsten who is about seven seconds back and this gap looks like it will hold. The last 2 km turns right, left, then right onto an uphill strait finish. Breukink does not look like he is in a mood for anything but finishing and is out of the saddle as he finishes. Breukink raises his hands in salute to this amazing stage, but Hampsten is within sight and finishes seven seconds back Hampsten will move into the leaders jersey as no one else is in sight. Race radios had Chioccioli at 2:20 behind at the top, but he was suffering badly in the cold and at last report was nearly 5 minutes back. Both Breukink and Hampsten have collapsed at their team cars and are being rapped in as many warm clothes as available. Hampsten seemed delirious and was swinging his elbows back at team doctor Max Testa as he tried to put a jacket on him. The next rider in view is surprisingly Stefano Tomassini (Fanini 7-Up) who has come out of nowhere to finish at 4:39 with Giupponi and Giovannetti at 4:55 and 4:58. Zimmerman and Chioccioli are next at 5:05 and 5:08. Chioccioli is totally exhausted and can barely function. Delgado has lost time and will have to wait for the Tour de France next month to try for a second grand tour victory(He won the Tour of Spain in '85). The race behind is all over the mountain. Riders are in panic from the cold and are stopping on the side of the road. Bob Roll was seen running up the road in a desperate attempt to get warm. Andy's words at the start of the day have come true. Others are stopping to get in cars with spectators just to sit in a warm place. Ron Keifel passed Czeslaw Lang (Del Tongo) who in short sleeves was descending at 2 mph. Andy has been told he has the race lead and has both laughed and cried. He and Breukink have both made their podium appearances and are providing interviews but it is obvious they could not begin to explain what just happened on Gavia. Andy just put on his first maglia rosa. The pain he went through seems to be fading as his smile is wide and bright. Riders are crossing the finish and are collapsing in their team support's arms and are making pitiful sounds of pain and complete emotional exhaustion. Bob Roll who is known for his tough riding is in complete collapse and is being revived by spectators who are bouncing him in a hug that seems very misguided. Time cut offs have been suspended and everyone who finishes today will start tomorrow. Everyone has much recovery before the start tomorrow and the forecast is not much better for the next two days. Visentini and Saronni have lost 20 minutes on the day and Van Der Velde has finally appeared at 43 minutes back. Everyone today has become cycling legend. Everyone will have their own story of what will forever be a fraternity of riders who survived Gavia 1988. • Read Andy's own account of the race, as interviewed by PEZ here. The 2014 Giro d'Italia's stage 16 covers both the Passo Gavia, and Passo dello Stelvio, in what should be another epic - stay tuned to PEZ for all the action.